Hamsters love to run. Way before they were our little furry pets, hamsters had to contend with all sorts of issues in the natural world. Predators were constantly trying to catch them and they needed the ability to run away. Thankfully for our little friends, there are a number of hamster toys available that encourage them to keep on running! 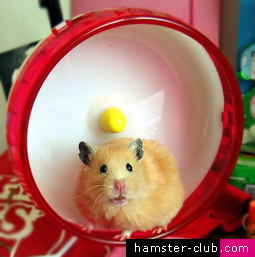 The most popular running toy for hamsters is obviously the wheel. No hamster cage is complete without an exercise wheel. Choosing a hamster wheel for your pet isn't rocket science but there are a few things you should consider. The first thing to look at is the size of the product. If the wheel you buy is too small, there is a chance that your hamster will be uncomfortable while using it. Generally speaking, dwarf hamsters should use the smaller styles available. The bigger Syrian hamsters, on the other hand, are more comfortable with large wheels. If you're not really sure what to do, just go with a larger model. Having a hamster wheel that's too big isn't really a concern. Other than the size, there are a couple other things to think about when choosing a hamster wheel for your pet. Consider the noise level for example. This is particularly important if you live in an apartment or you share a room with your little friend. Spending a little bit more on a decent product will ensure your hamster has a nice quiet ride. It will also mean that you sleep a little bit more soundly at night. The one component that every hamster wheel should have is a solid running surface. The classic wheel that looks like a mesh cage isn't what you're looking for. These products, while inexpensive, are actually quite dangerous for hamsters. Your pet could very easily get one of his little feet stuck in between the bars. Spend a bit of money and get your pet something safe to exercise on.